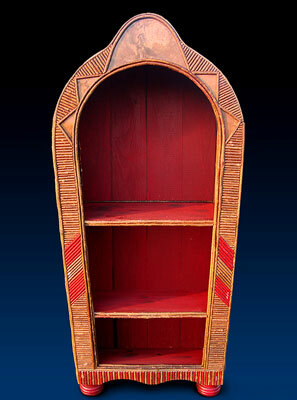 This piece - "archway" or "coffin cabinet" or "around the top" or "circletop cabinet" was built for the display of art or books. It measures 26" wide at the floor with a flair to 32" near the top. It stands 65" tall and is 20" deep. It's built from poplar and pine and covered in handpicked willow saplings and patina copper. The upper arch is solid wood covered in copper both inside and out. This one-of-a-kind piece is on display at the Yellowstone General Store at Fishing Bridge. Contact us to discuss what we can make for you. We ship anywhere in the country at a fair cost.